When I started out as a newlywed cook 35 years ago, I wondered at my maternal grandmother’s advice to add a little of this and a little of that. Craving her chocolate meringue pie one day, I called and asked her how to make it. She estimated the measurements for me the best she could. Her expertise in how much of each ingredient went into each recipe gave her an ability that I had not yet accomplished. Things have changed – at least with vegetables. When deciding on which vegetables to stir fry, I open the refrigerator and grab whatever I have on hand. If I made a chocolate meringue pie, I would look at a recipe and choose specific ingredients. Imagine grabbing whatever ingredients you have on hand to make a chocolate pie. Let’s see, right now I have chocolate almond milk, vanilla yogurt, organic vanilla milk and free range eggs. Those sound like they could go in a chocolate pie, right? Add some of the dry ingredients I have on hand like Hershey’s Chocolate, flour, baking powder, sea salt, and honey. They include three white ingredients, and the meringue is white. That could work, couldn’t it? Somehow, it doesn’t measure up to what Mama Beatrice taught me. I think I’ll stick to a little of this and that from the veggie section. Digging in the frig for any vegetables on hand, I came up with a different medley. 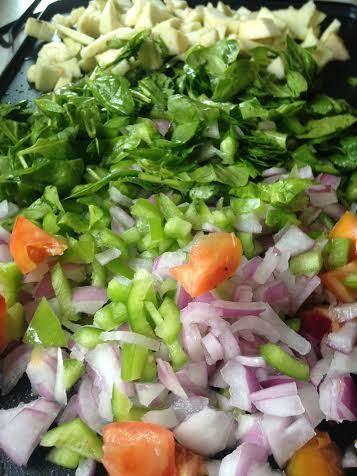 Red onion, spinach, two Roma tomatoes from my herb and vegetable garden – and half of an eggplant. The idea was to make a veggie omelet. Eggplant in omelets? Yes, I decided it was worth trying. Eggplant has the word “egg” in it; therefore, the two surely would taste great together. Curious to know where the word “eggplant” originated? According to Wikipedia online research, some 18th-century European cultivars were yellow or white and resembled goose or hen’s eggs, hence the name “eggplant”. While I cooked the vegetables on the griddle this morning, I noticed something I hadn’t paid attention to before when cooking eggplant. Peeled, chopped eggplant (the skins are edible incidentally) looks like chopped apple. In fact, there is a Green Apple eggplant that looks like a Granny Smith apple in shape and color. Stir-frying plenty of vegetables, there was enough for the omelet and to mix with brown rice for dinner this evening. Yes! That means no more cooking today and more time for blogging. Sprinkle seasoning and a little sea salt on top of vegetables. Stir fry vegetables in coconut oil on griddle. Set aside. 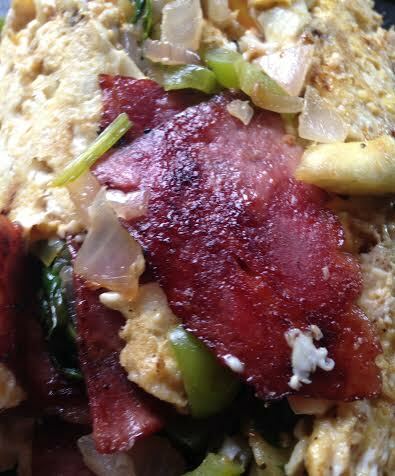 Cook turkey bacon and slice. Let eggs set about half a minute then stir like you’re going to scramble the eggs. Add the vegetables to the eggs and stir. Shape mixture into a rectangle. Let set another half a minute, then fold over from one side to the middle. Fold over the opposite side to the middle. Add an extra slice of cheese on top if desired. I never ate much eggplant growing up. My parents didn’t like it. I have begun to use it as an adult. It is very good. I never thought to add it to my omelettes. I’ll definitely have to give it a try. Have you ever made tempura? I love eggplant tempura. Of course, dipping veggies in batter and deep frying them probably isn’t the healthiest way to cook them. They sure taste good, though. I haven’t made the eggplant tempura.